1 How do I Choose A Badminton Racket? 6 Should I buy a junior-sized racket for a child? The most important piece of equipment in badminton is your badminton racket. Your badminton racket can either complement your natural strengths or hinder them. I’m here to make sure you find a badminton racket with this specially crafted how to choose a badminton racket guide. How do I Choose A Badminton Racket? When you are a beginner, there is really only one question you need to ask yourself for selecting a racket: What colour do I like the most? When you are a beginner, it is hard to go wrong with any racket, granted that it is from a reputable brand in your country. As long as it is a one piece carbon fiber frame it will generally perform well until you get to the higher end rackets. However, if you wish to research more, or even need help selecting a racket when you are more advanced, you can read on ahead. The most important factors when selecting your first long term racket, beginner or not, is the following: the balance of the racket, shaft stiffness, weight and grip size. I will be going over each category in this article. There are other factors besides the balance that can change how a racket plays. These will be highlighted in the next section. There are a few standard weights and grip sizes that all manufacturers use for badminton. They are labelled a bit differently depending on the company. For example, 3U (85-89g) G5 (81mm) is the Yonex way of coding that weight and that grip size. Li-Ning, however, chooses to do it as 3WS2, also meaning 85-89g weight and 81mm grip size. With a quick google search, these are easy to find and most rackets come in a variety of weights and grip sizes. Why is this important when selecting your racket? For starters, a heavier racket may be very hard to use when you have not built the muscle memory to swing a racket yet. On the other hand, if it’s too light you will find it difficult to build the muscle required to generate power. There is a fine balance between finding the right weight and the right balance. The grip size is mostly personal preference, but my personal rule of thumb is to always get G5 (81mm) or the smallest one available, usually G5 or G6 (smaller than G5). The reason being, it’s very easy to build up with extra over grips, but it’s very difficult to downsize a racket grip. Children who start off with very thick grips run into problems of not using enough fingers to generate power when they are older because they had to rely heavily on their arms when they were beginners. When you select the weight of your racket, the only thing I recommend is to not go too light. 3U or 4U (80-84g) are the most popular weights, but they can go as light as 60g! For the reasons stated above, I recommend staying in the 3U and 4U range. Sidenote: It is often very beneficial to get custom stringing on your rackets. The factory strings that come with lower end rackets are often not very repulsive or responsive and hinder the playing experience. I recommend a couple of the best badminton strings here. For a good pick though, the [amazon_textlink asin=’B00EMVI49M’ text=’BG65 @ 24lbs ‘ template=’ProductLink’ store=’racquetspor06-20′ marketplace=’US’ link_id=’9420a10f-953d-11e8-8409-17b1a02bb80a’]is a standard tension for any recreational or beginner player. With all the information above, it is up to you what kind of racket you want. Depending on how far you want to go and how much you are willing to spend, you can base your choice from there. If you enjoy playing once in a while with friends, the best racket is a 4U even balance, 3U head light, or 4U head heavy racket. If you are just selecting a racket for your child, the best bet is to select a even balance 4UG5 racket and ask them what colour they like from there! Should I buy a junior-sized racket for a child? There are generally two standard racket lengths for badminton rackets. One is a junior size [xxmm] and the other is 675mm. When young children begin playing and need to select their first racket, many employees will recommend a shorter racket to better match their height. This is not always the best choice, however. Using a shorter racket can be detrimental to a young players growth in technique. This is because the timing for a shorter racket differs between a regular sized racket. The weight difference is also quite evident due to the shorter racket requiring less material. Take this a shot called a clear for example. If a shuttle is hit to a child and they are using a short racket, the swing will be started later than with a standard racket due to the highest contact point being lower. When they eventually outgrow the junior sized racket they could possibly need to relearn the whole swing. That is the argument for not having a junior sized racket. The only time you would want to use a small racket is for very young children, around age 4-5. A good way to tell when a short racket is required is to do the following test: raise up their elbow with the pinky side of their hand pointing upwards and the racket pointing downward. 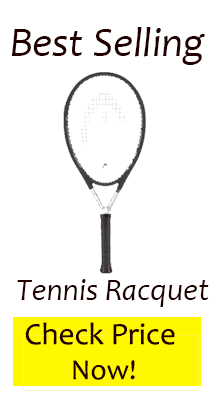 If the standard sized racket reaches the ground or very close to it, then a junior sized racket may be required. The reason for the above test is the overhead swing requires the mentioned rotation and if they hit the ground with their racket it can affect the swing.